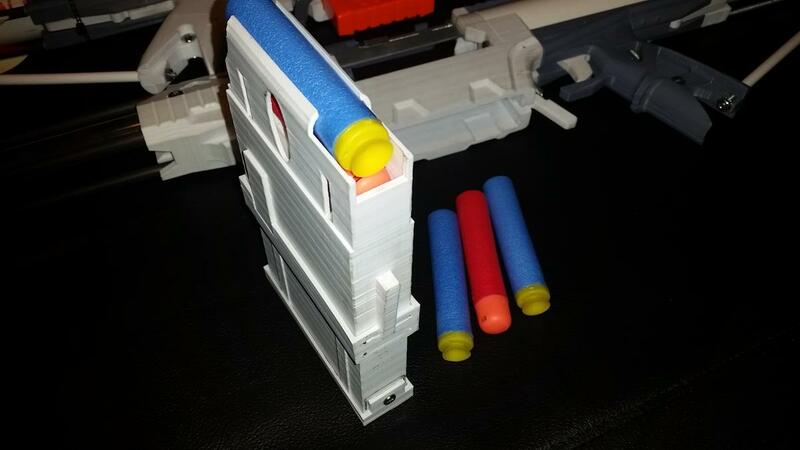 Caliburn that can shoot Nerf Mega and BuzzBee XL darts. Location:A place in a state. 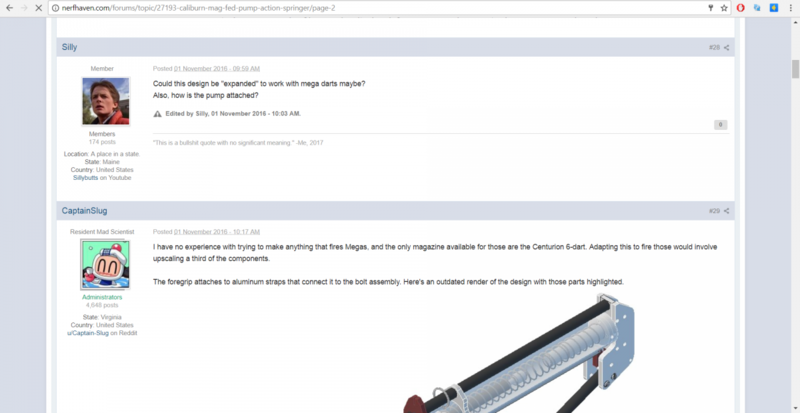 Well now at least I don't have to keep thinking about how to make one that shoots Megas. Been designing since around xmas. Edited by Silly, 19 August 2017 - 02:46 PM. But I need one of these that fires rival balls. /u/PianoManDaniel is working on that. I disn't realize this at the time, but you can't hear sarcasm through nerf hayven. Sorry about making you leak that. Leak what? It's posted publicly. Arguably more publicly than posts here, since it seems like more people are using reddit than NH ATM. 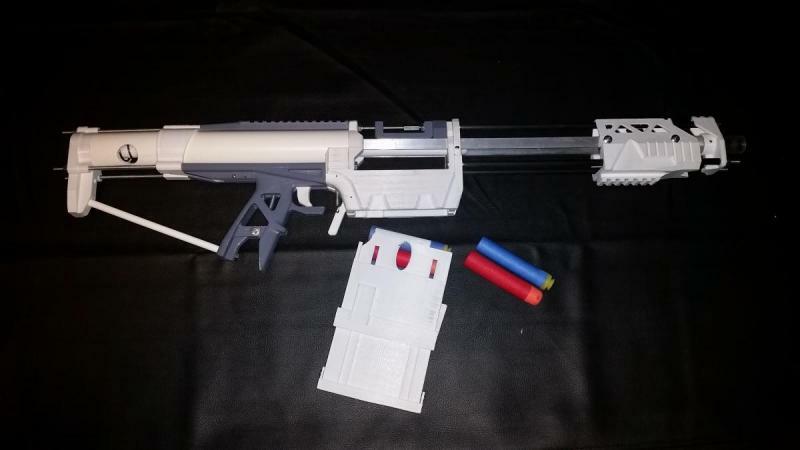 Now all we need is a vortex caliburn. I have yet to own or take apart anything from the vortex line. They are propelled by being directly smacked by a torsion spring with an arm on it. True, but captain Xavier and someone else I can't remember have made titan attachments for vortex, so it may be possible. It's probably just a planar rival-style barrel with a 'hop up' nub. Also probably takes a ton of air volume. Vortex is gud, but what about boomco darts? That would probably peirce cardboard if caliburn could use boomco darts (straws?). This is seriously nor sarcasm, I really would like a boomco caliburn. Edited by Eightdotno, 28 August 2017 - 12:25 PM. I hear straws go unstable at the +/-200 FPS Caliburn is capable of. You'd need a box mag for Boomco rounds or a magwell capable of feeding the Boomco clips. Fired from their clips with no barrel they might work but that defeats the purpose of a massive PT, you might as well just use an M6 or the clip-fed pullback they had. From my /limited/ understanding of high-velocity boomco blasters, they are stable at such speeds. However, creating a breech/barrel system that can reliably feed them is the difficult part. You'd likely have to talk to Boomtendo or Toruk in that regard. The sealed/longer barreled boomco blasters that I have seen require intense lubrication of barrels and/or modification of the straw heads into more of a hotglue-dome type of ammunition. The heads are wider than the straw itself (and annoyingly rubbery), which is problematic. Thus, difficult and/or unsafe. You know this somehow relates to a project I have been wanting to do ever since I started nerfing, I will post that idea in a different post, but I will ask Boomtendo about it. Edited by Eightdotno, 29 August 2017 - 12:43 AM.